We’ve been slowly grinding through the monster Steam leak from late last year over the past few months. As games like Danganronpa and Everybody’s Gone To The Rapture appeared it became obvious that the rest of the list was probably on the way (except Half-Life 3, natch) – and so here’s another, with Final Fantasy X / X-2 Remastered making the jump, fulfilling something I’ve wanted since mid-2002. The Steam page is up now for a May 12 release, that’s Thursday, and there’s a batch of screens and other details contained within. Not your bag? Try one of the other best RPG ever. Along with the features you’d expect from the console version, like it being way prettier, there’s some additional extras for PC players only. These include the now-standard ‘boosters’ that Square Enix have been including in their ports, which allow you to cheat (hey, if you wanna) but more interestingly can turn off encounters, or let the game run at increased speed. There’s also an auto-save function to avoid classic dinner-in-the-middle-of-a-battle conundrums, and some of the music has been reworked, though details on that will have to wait. As for actual game content, this is the International Edition of the game which adds a batch of additional bosses and some balance tweaks. 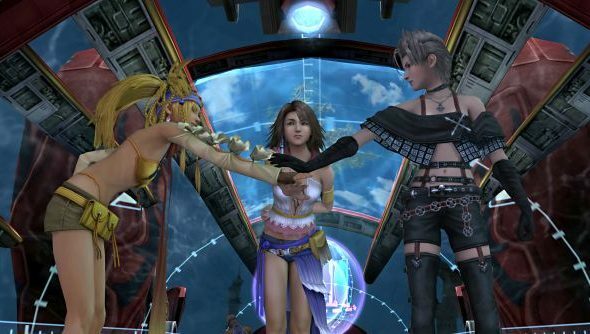 You can read the full list of changes between FFX and FFX HD on the wiki. What you should be really excited for is FFX-2, because it’s fabulous, if slightly janky. Very good battle system though, and character transition animations include jumping over the moon – I’m well behind it. As more and more FF games release on PC – this makes it so that the only modern one unavailable on the platform is now FF12, which is well overdue for its own HD Remaster, likely decided by how well these ones do – it raises the hope that both FF15 and FF7RM will make it to PC eventually. We’ll maybe hear more about that at E3, which is now just a month away.